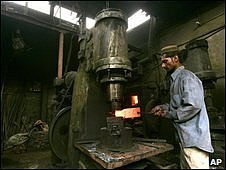 A power company in Pakistan has obtained a decree - or fatwa - from 12 senior Islamic scholars, declaring the theft of electricity a sin. The Karachi Electricity Supply Company (KESC) says the thieves are costing it 1bn rupees ($12.3m) a month. People had to realise, it said, that stealing electricity was as illegal and immoral as any other form of theft. Many people in Karachi either siphon power from overhead cables, or slow down their electricity meters. The 12 scholars said that, according to Islamic Sharia law, unpermitted use of any commodity, and gaining benefit from it, was "sin, theft and usurpation". Legal action against the thieves was fair, they said, and allowed under the teachings of Islam. And they directed Muslims to pay back an amount equal to the power they had stolen. The company already has the right to fine those caught stealing electricity. Much of Pakistan is suffering power problems, caused by increases in demand, a lack of investment in infrastructure and the theft from the electricity grid. Karachi, known as the "city of lights" has a population of about 16 million and is Pakistan's biggest city and commercial hub. 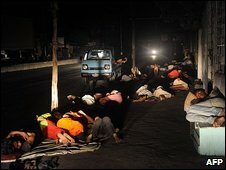 Last Saturday, there were street protests after rain and high winds again brought power cuts. And on 17 and 18 June, millions lost their electricity supply for hours due to what the KESC descibed as a "technical fault". It left people without fans and air-conditioning in the summer heat, and brought industry to a halt.